The Jagdpanther was the result of the need for a hard-hitting tank destroyer mounting the 8,8 cm gun. It was previously tried twice with the Ferdinand and the Nashorn, with limited success. While the gun itself proved to be spectacular for the role the carriages it was mounted on proved to be less than stellar. Using the panther chassis was a logical step given the ability to easily mount the 8,8 cm Pak 43/3. The chassis was better able to support its weight when compared to the Nashorn and also had a closed compartment. Much lighter and nimbler, the advantages over the Ferdinand are obvious. It also had lower silhouette when compared to the Ferdinand. The Jagdpanther was organized into independent heavy tank destroyer battalions. It had a headquarters company and three panzerjäger companies. Three Jagdpanther befehlswagen (command version) in the headquarters company and fourteen Jagdpanther in each of the panzerjäger companies. That gave a total of 45 Jagdpanthers. They were organized in accordance with K.St.N. 1154a (fG) v. 1.3.44 for the headquarters company and K.St.N. 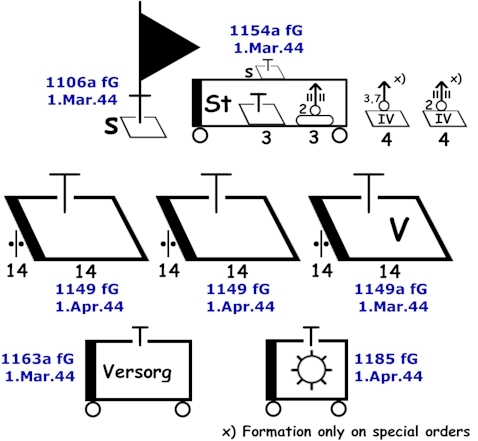 1149a (fG) v. 1.3.44 for the three panzerjäger companies. The battalion also had a headquarters staff unit (K.St.N. 1106a (fG) v. 1.3.44), a supply company (K.St.N. 1163a (fG) v. 1.3.44) and a workshop platoon (K.St.N. 1185b (fG) v. 1.3.44). 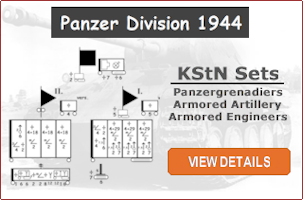 This was the organization authorized for the schwere PanzerJäger Abteilung 654. However, due to production delays it would take months to get all the authorized Jagdpanthers. The last Jagdpanthers shipped out on August 14th, 1944, with the exception of the three 3 command Jagdpanther. 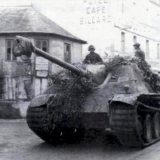 Those were replaced with three Panther befehlswagen and shipped to the unit on July 6th, 1944. Production would continue to be hampered and inadequate for the number of Jagdpanther required for the planned units. In September 1944, Hitler ordered that a new organization for the Jagdpanther battalions. This organization would drop two of the Jagdpanther companies, replacing them with either Jagdpanzer IV or Sturmgeschütz companies. These new Sturmgeschütz companies woudl be organized using K.St.N. 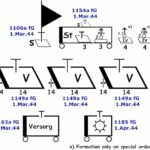 1149 (fG) v. 1.4.44. An example of this organization can be seen in documents available in the document set below. Schere Panzerjäger Abteilung 525 was to be organized with one Jagdpanther and two Sturmgeschütz companies. However, they were never reorganized as a Jagdpanther battalion and the unit remained in Italy with Nashorns. The schwere Panzerjäger Abteilung 559, on the other hand, used this organization. They were shipped five Jagdpanther on May 18th, eleven on August 24th and two on September 3rd. Presumable fourteen of them for the Jagdpanther company and three for the Stabs (HQ’s) unit. However, by my count, this did leave them with an extra Jagdpanther. The two Sturmgeschütz companies were filled with 28 Sturmgeschütz III, which were shipped out to the battalion in August. The first nine shipped on the 21st, ten on the 23rd and finally nine on the 25th. The schwere Panzerjäger Abteilung 560 had a slight variation on this theme. They not only had Jagdpanzer IV /70 in the two Sturmgeschütz companies, but also in their Stabs unit. 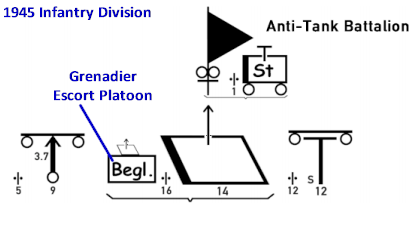 The berge group in the Stabs Company was authorized 3 Sd.Kfz.9 and one Sd.Kfz.9/1. 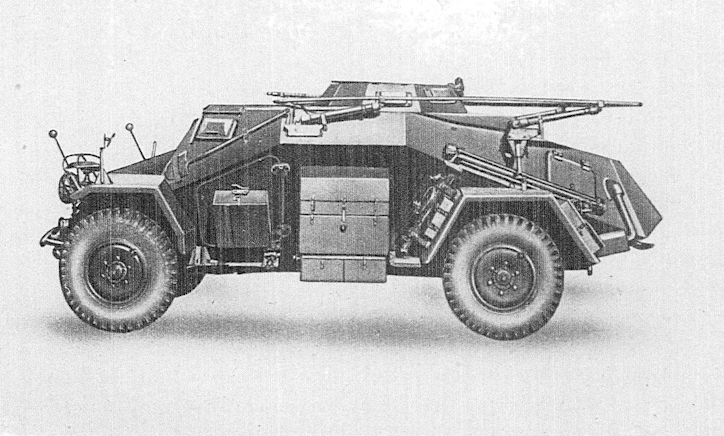 They were also authorized 3 Sd.Kfz. 7/1 in their Fliegerabwerhtrupp. The workshop platoon was authorized an additional 3 Sd.Kfz.9 and one Sd.Kfz.9/1. Some units were also shipped Bergepanthers. Schwere Panzerjäger Abteilung 519 was shipped one on September 27th, s.PzJg.560 was shipped two on November 11th and s.PzJg.654 was shipped two on November 13th. The s.PzJg.654 was shipped three 2cm (Quad) Flakpanzers on December 24th, 1944.
. Jagdpanther Orders (<10MB) . I am not sure to which photo you are referring, typically i only use NARA or BAMA photos. The BAMA photos have the photo identification information across the bottom. Not sure what BAMA’s rules are about publishing them in a book but i suspect there are fees. If it is a NARA photo i can probably tell you the source for it. The NARA photos are public domain and can be used in publications free of charge, you just need to credit the source.